Since September I have been working countless of hours with only Saturdays during the week where I can leisurely take a moment away from all things digital to catch up with some friends. Over a cup of coffee, a food adventure, dining out at the latest trendiest restaurant or what I enjoy most house warming potlucks! If I was able to afford living independently or share an apartment with an awesome roommate, I would have potlucks every week creating what I call are my specialties, one pot wonders. To define one pot wonders it requires only one pot of course and all kinds of ingredients and some seasoning. 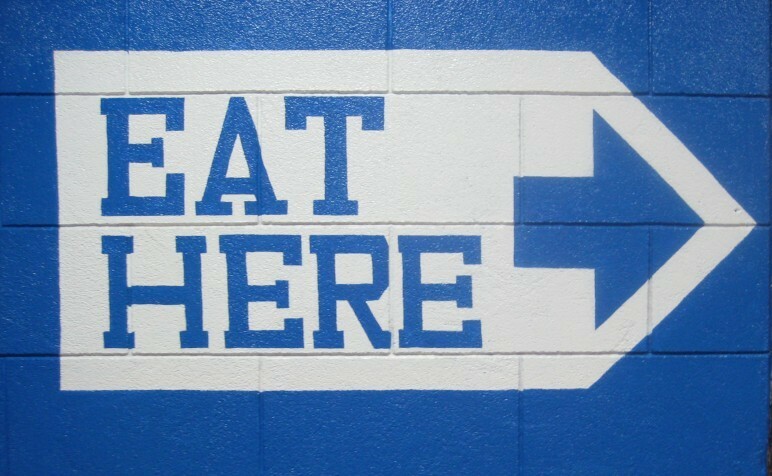 One pot dishes essentially is universal, with the Spanish Paella, French Cassoulet and the American Macaroni & Cheese. Few weekends ago, I was invited over to my friend Hiroko who is expecting their first baby in December. Since I had missed their baby shower, her and her husband had reserved a day just for me! Hiroko had asked me via email whether I liked to have her special vodka pasta or her curry and I instantly replied curry! I made a trip from Lower Manhattan to Little Neck, Long Island and was greeted with 7 months pregnant Hiroko but she was still able to swift around the kitchen preparing our lunch like a pro. Already cooking was the curry and I have to be honest I was really shocked to find out Hiroko uses the bar curry that dissolves with boiling hot water. 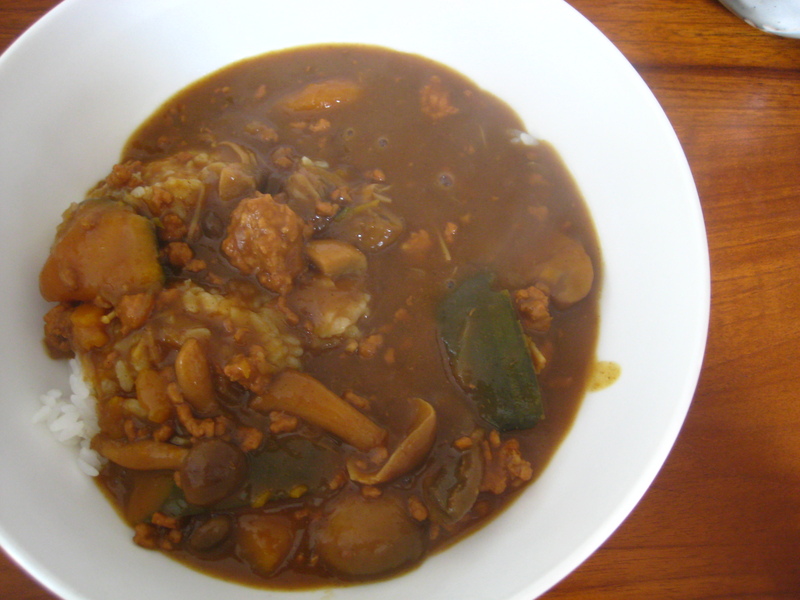 What differs in Hiroko’s homemade curry is what she puts in it, with minced pork, sauteed mushrooms and onions, and kobocha squash and slow cooked for a good 3 hours. Finally served over white rice, it makes an appropriate, hearty, comforting deliciously addicting autumn meal. Later we took a neighborhood stroll, Hiroko had suggested to visit the local county farm, it was the Queens County Farm Museum. I was really excited to visit the Queens County Farm Museum for the first time in my adulthood. I may have visited as a child during elementary school field trips. The farm had a variety of farm animals including llamas and donkeys and very well fed healthy pigs and rabbits. There was a corn maze and surprisingly a beautiful grape vineyard. It is a Queens County gem! More one pot wonders at this past Saturday, I reunited with a few former colleagues at a backyard Bushwick, Brooklyn block party with a nice open fire to set the atmosphere. The host Kristin made amazing apple cider with rum, genius! It was perfect for the unusually frigid autumn. In addition to some cream cheese topped pumpkin muffins. Her neighbors had made a cottage pie which I learned is similar to shepherd’s pie except traditionally with beef instead of lamb. There were two risotto contributions and a mysterious chickpea, onions, potato, tomato sauce presented on cast iron skillet dish. There was the savory pie and the sweet tooth pie. 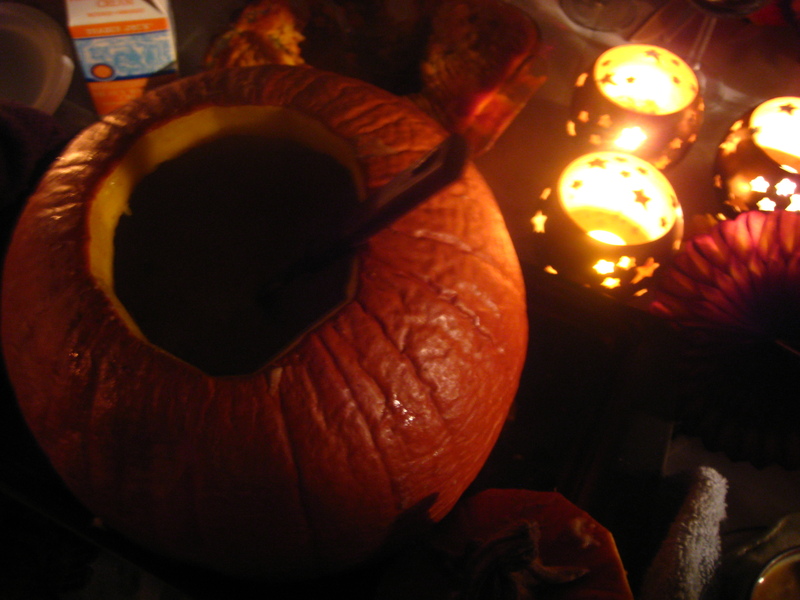 For a cold Saturday evening, a hearty french onion soup in a giant post Halloween pumpkin makes a great center piece for decoration and a great alternative to a regular boring bowl. It was a fun, friendly, free spirit gathering over good homemade food that makes great autumn harvest memories. Thank you to both for the invitation!